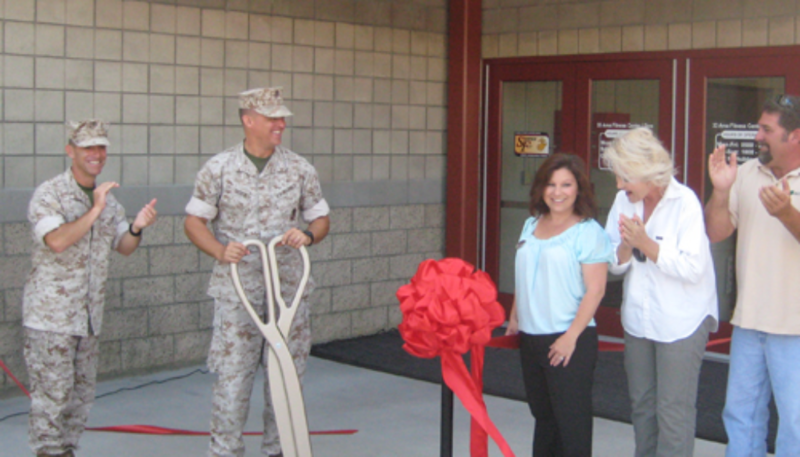 The newly constructed $12.5 million dollar Physical Fitness Center constructed by Soltek Pacific Construction Company in the 33 Area of Marine Corps Base Camp Pendleton, CA has achieved LEED-NC-2.2 Platinum Certification. The Platinum Certification was awarded by both the U.S. Green Building Council and the Green Building Council Certification Institute. LEED Platinum is the highest level recognized by the two leading agencies in sustainable design and construction standards. The 26,000 sq. ft. Fitness Center was awarded to Soltek in August 2009 and celebrated its grand opening on December 9, 2011. The facility serves the individual physical ﬁtness, training, skill development, and recreational needs of 5000 military personnel in the Camp Horno 53 Area. The facility’s design attractively combines a mixture of colored exterior masonry walls and prefinished storefront with standing seam metal roofing in accordance with Camp Pendleton’s design standards for Indoor Fitness Centers. LEED elements incorporated into the project included the use of renewable energy from 200 kilowatts of solar electrical power and hot water provided by solar heating panels, which resulted in an energy reduction level of 31% below the Title 24 standard. Other contributors to this notable achievement included the diversion of 75% of the project’s construction debris from local landfills, along with the use of sustainable finishes with high-recycle content and low emissions. Additional credits were attained through the use of high efficiency HVAC systems and low-energy consuming light fixtures. Achievement of LEED Platinum Certification on this design-bid-build project is attributed to the successful collaborative efforts of the Soltek and NAVFAC project teams.